As the title suggests the theme for last weeks Unplug Your Kids was Flag. 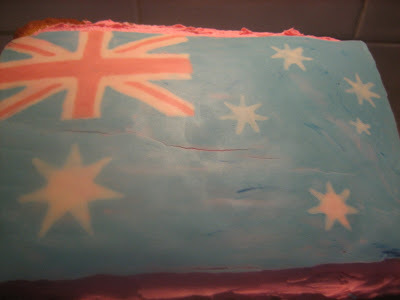 Years ago I saw a lovely Australian Flag cake which i've been wanting to make ever since. They used strawberries for the red, blueberries for the blue and white chocolate for the white. Well, I didn't make it (stawberries and blueberries, that's just expensive) so I remembered a post I did called Chocolate Polkadot Topped Cupcakes and thought i'd use the same method to do the Aussie Flag (except I used an Aussie Flag template). Petal and I spent a lot of time in the kitchen working on this. Making the cake and icing. She didn't do the topper (that was purely my indulgence) so she did a little topper which turned out to be a giant mound of chocolate, yum for her! 1. a) Under the white piece of paper is an Australian Flag colouring page from coloringcastle.com, they have 23 flags from around the world there. You can use marker to trace the flag on the other side so it's easier to see. I only thought of that after I had made it!! 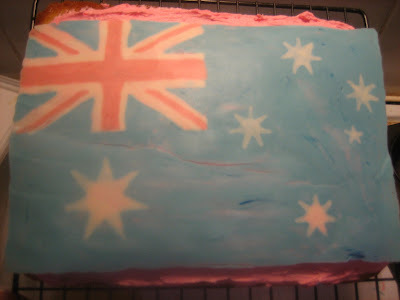 b) On our Flag, The Union Jack (the red cross thing) is situated on the top left corner but i've flipped the sheet over so it's bottom left, so when you flip the topper onto the cake it's the right way up (hope that makes sense). 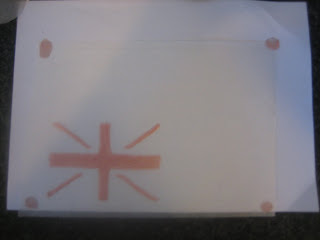 c) I used parchment paper for this as I needed to see through to the flag template. I secured the parchment onto the paper using chocolate. Coming together nicely. 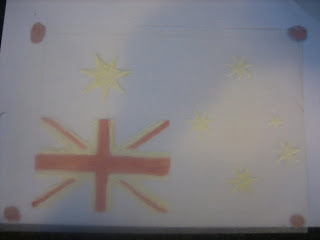 I've added the Southern Cross. a) Now, wait until it sets. I put mine in the fridge for a while (maybe 3-5 minutes) and the paper curved up which made a big crack appear in the middle of the topper. Put the topper in the fridge for no more than 1 minute so it is hard enough to peel from the parchment. b) I covered the white chocolate stars with the blue but I don't recommend it. The white stars ended up having a blue tinge. c) Now don't ask my why I decided to have pink icing, I think it looks terrible. 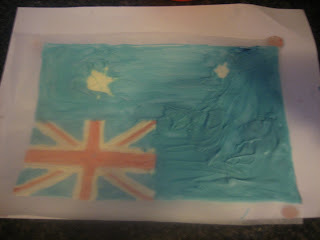 I should have done a blue icing to blend in with the flag. Wow, that's a pretty complicated project, sure looks yummy. Wow! What a great cake. What a great job. It looks yummy. Wow! That turned our GREAT! even with the pink frosting it looks tasty!! It wasn't really complicated it took time and you just need to know what to do. You learn as you go!